SwiSS-9 surface treatment is a two component liquid solution that once deposited atop suitable surfaces produces a protective and particles and liquids repelling coating. Swiss-9 bonds chemically with glass, ceramic, metal, stone, wood, textile or any other oxide rich surface and creates a durable ultrathin layer. The coated surface becomes transparent Teflon-like with outstanding hydrophobic characteristics. The technology is based on silane chemistry and was researched and developed in close collaboration with Advanced Materials Processing Laboratory, EMPA-Thun. It is proudly manufactured by Swiss-9, GmbH in Switzerland, an “EMPA Spin-off company”. Most traditional construction materials such as brick, rock, wood, glass, metal, etc. possess intrinsically polar surfaces. The intrinsic polarity of these surfaces originates from the nature of the chemical bonds between the atoms comprising these materials. As a result, surface energy of these materials is relatively high and it diminishes the likelihood of environmental deposits not finding residence atop of these surfaces. 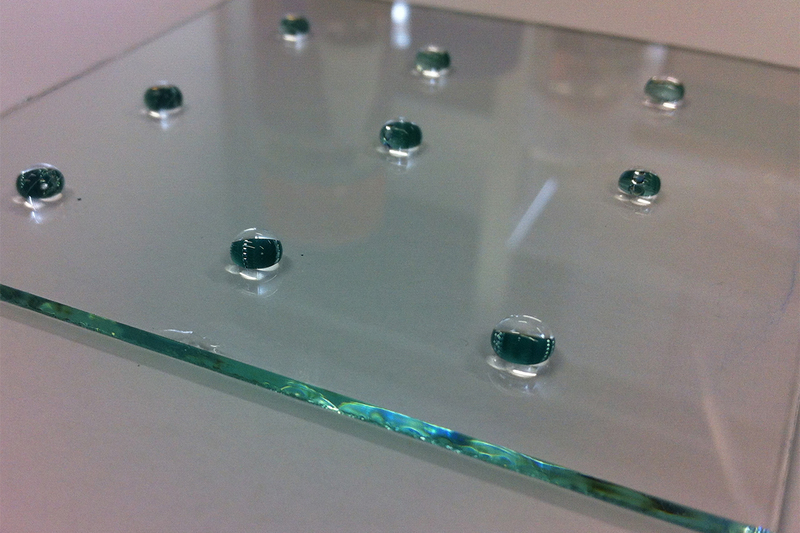 We have developed a wet-coating solution that post-deposition changes the top layer of the material by attaching a Teflon-like film atop the surface. This film hides surface electrons from contact with the environmental deposits and in doing so increases the likelihood of these deposits preferentially finding a more stable thermodynamic residence away from the Teflon-like film covered surface. The visible spectrum transparent and anti-reflective nature of the film does not change the naked eye appearance of the surface, and in addition it increases the portion of the incident light that transmits through the film as opposed to getting reflected off. The combination of coating’s Teflon-like surface characteristics that lower intrinsic surface’s attractive potential and transparent appearance results in an upgrade of the construction material that remains esthetically unchanged but with an added function of repelling oncoming unwanted environmental particle deposits such as sand, dust, lime or automotive exhaust products. The coating is efficient in repelling liquids as well, a famous lotus leaf effect, or an ability to convince water and oil molecules to stay together and form pearly structures that roll across the surface as opposed to spreading atop it and contaminating it with enclosed particle deposits post evaporation. 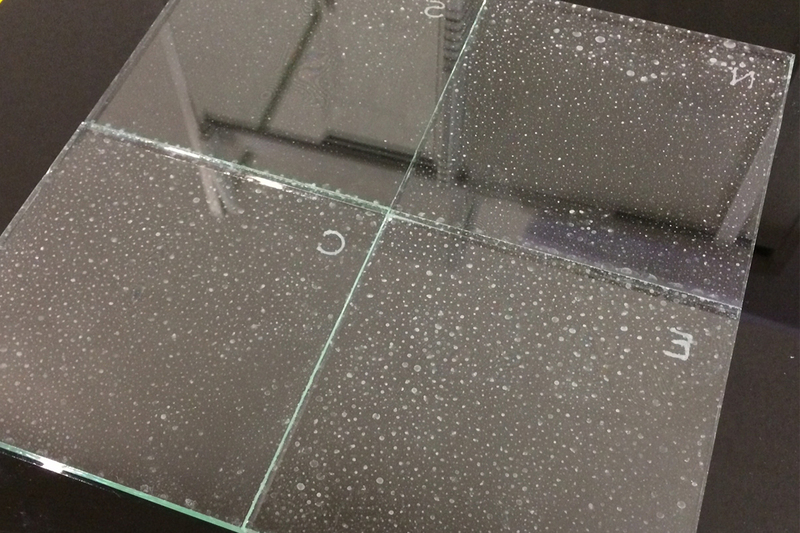 The transparent coating increases by about 5% the portion of the incident light that gets transmitted through the surface in addition to decreasing the frequency of needed cleaning cycles. Any unwanted surface deposit that may find permanent residence atop the coating will be easier to clean and remove due to the crippled adhesion between the coating and its deposits. 1 Static Contact Angle quantifies the ability of a surface to repel or attract liquids, if the water contact angle is larger than 90°, the solid surface is considered hydrophobic; Highly hydrophobic and atomistically flat surfaces made of low surface energy (e.g. fluorinated) materials may have water contact angles as high as ~110°). 2 Dynamic Surface Response is the amount of energy input a drop needs to overcome interfacial adhesive attraction and commence movement across its solid surface. 3 The coated surface suffers less soiling so the frequency of cleaning is lower and the deposits could easily be cleaned with a wet or dry towel as the surface is non-stick. The cost of materials for surface coating is approximately 3.00 CHF/m2. One liter of the first and second component covers approximately 125 m2.